Spring is in full swing! Gorgeous spring vegetables are everywhere. Among them is asparagus, which tastes best at this time of year. Another spring treasure is tender, thin green onion, called shilpa. It’s mild and sweet. I decided to put these two spring vegetables together with shrimp for these little rolls. Ganghoe is a general term that refers to a dish that is made by tying ingredients with a thin green onion. It’s a spring favorite. 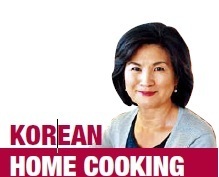 Nakji (octopus) ganghoe and ojingeo (squid) ganghoe are common variations. Ganghoe dishes are prepared in bite size pieces and served with a sweet and sour red chili sauce. They are great as an appetizer! Bring a medium pot of water to a boil. Add the shrimp, and cook briefly, about a minute. Quickly drain and dump in cold water to stop cooking. Drain. You can cut small slits on the inner curve of the curled-up shrimp to flatten a little for easier wrapping. Remove the tough ends of the asparagus. Cut into about 5-centimeter lengths. Blanch them in salted boiling water until softened, about a minute. Remove with a strainer, and shock in cold water. Drain. To the same pot of boiling water, add the white parts of the scallions, and hold for about 30 seconds before submerging the whole scallions briefly to soften, about 20 seconds. Drain, and shock in cold water. Gently pat them with a kitchen towel or paper towel to remove excess water. 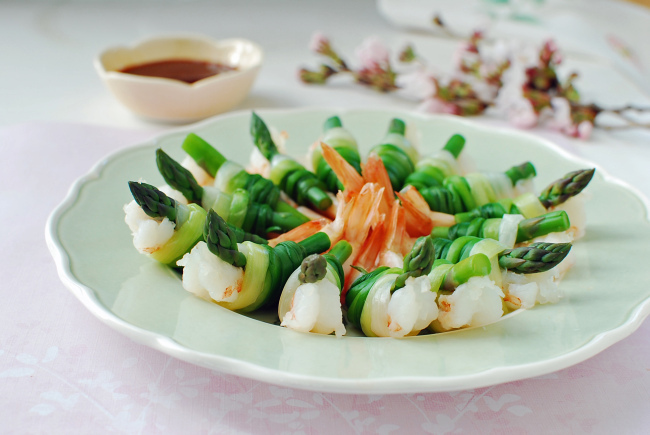 To assemble, hold a shrimp and an asparagus piece together along with the white end of a scallion. Tie them together by wrapping the other end of the scallion around the shrimp and asparagus several times. Use a chopstick or a toothpick to tuck the end of the scallion into the roll. Mix the sauce ingredients well. Serve the rolls with the chili sauce.